Experiencing Bennett in concert is watching joie de vivre come of life. The ageless crooner was full of vitality, charm, warmth, humility, grace, courtliness, smiles and, of course, joy. Why See Jazz at the Bowl: Tony Bennett? Fall under the spell of the most charming crooner ever to step foot onto the Hollywood Bowl stage this Summer! That's right, living legend Tony Bennett and his smooth-as-honey stylings are topping the historic venue's Jazz at the Bowl series bill and bringing along a rich musical history that spans over seven decades, 50 million in record sales, nineteen Grammy Awards, a Lifetime Achievement Award, a Gershwin Prize from the Library of Congress and two Emmy Awards. A self proclaimed 'tenor who sings like a baritone', Bennett rose to prominence after fighting in the Second World War. As a US Army infantryman, he was stationed in Germany and assigned to a special services band unit that would entertain occupying American forces. Upon his return to the states, he signed with Columbia Records and began recording. His bel canto training opened him up to both the pop standard and American Songbook repertoires. Don't miss career-defining hits like 'Because Of You' and 'I Left My Heart In San Francisco with live accompaniment by the Hollywood Bowl Orchestra. Sound good to you? 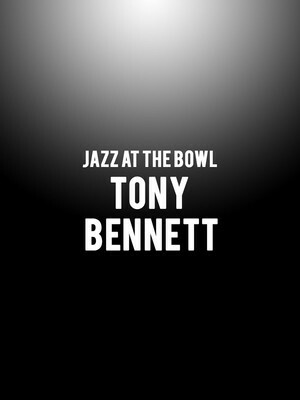 Share this page on social media and let your friends know about Jazz at the Bowl: Tony Bennett at Hollywood Bowl. Please note: The term Hollywood Bowl and/or Jazz at the Bowl: Tony Bennett as well as all associated graphics, logos, and/or other trademarks, tradenames or copyrights are the property of the Hollywood Bowl and/or Jazz at the Bowl: Tony Bennett and are used herein for factual descriptive purposes only. We are in no way associated with or authorized by the Hollywood Bowl and/or Jazz at the Bowl: Tony Bennett and neither that entity nor any of its affiliates have licensed or endorsed us to sell tickets, goods and or services in conjunction with their events.